Free Spider Solitaire's New v5.1 is Now available for Download! Added the new Free Spider Solitaire Graphics Pack, a free add in containing a series of beautiful card sets, card backs and backgrounds. The new game Rouge et Noir has been added (in place of Coleopter). Now you can play Free Spider Solitaire online at this address: http://www.free-spider-solitaire.com. Added a new "Single Click/Touch to move cards" option in the Options dialog box. It is automatically selected with the Windows 8 operating system. This new option will allow you to move cards by simply touching them (on touch screen monitors), or left-clicking them when using the mouse. Free Spider Solitaire includes new features to make it fully compatible with the new Microsoft operating system, Windows 8 and Windows 8 Pro (32-bit and 64-bit). The deal animation has been improved with a shadow effect on each card dealt. Not only is the new animation faster, it is also more realistic and visually appealing. The Select a Solitaire dialog box now uses new preview images and graphic indicators for 'Game time', 'Difficulty level', 'Skill level' and 'Chance of winning'. 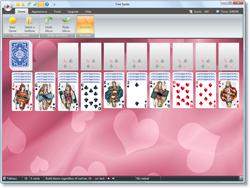 The solitaire layouts have been redesigned to better fit the user's screen resolution. The indicators for the foundations and tableau piles have been graphically improved and now have rounded corners. 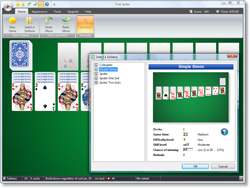 Free Spider Solitaire - v. 2.1 includes the Ribbon, a graphical user interface composed of a strip across the top of the main playing area. Ribbon interface is a part of the new Microsoft Fluent User Interface that replaces the menus and toolbars used until the previous version of Free Spider. The Ribbon is a way to enhance usability by consolidating related commands so that they are easier to find. Commands are organized into groups and related groups are organized on tabs. One need not look through multiple levels of hierarchical menus. Click here to see a screenshot with the ribbon. Free Spider Solitaire has a new "standard" card size, which is much larger than previous versions. Numbers and suits are easier to see, and images show richer, more enhanced details. The new auto-sizing feature will adapt the cards to any screen resolution, from 640x480 to 1920x1200 pixels and higher. Playing Free Spider Solitaire is now even more fun! Free Spider Solitaire features new card backs and new full-screen backgrounds. Click here to see the new card backs. One level of Undo and Redo.